A mini-thesis submitted in partial fulfillment of the requirements for the degree of MA in the Department of History, University of the Western Cape, June 2003. This mini-thesis tells the story of the African National Congress (ANC's) first armed military operation and its Luthuli Detachment. The latter joined forces with the Zimbabwean African People's Union (ZAPU) and crossed the Zambezi River on 31 July 1967 into Rhodesia. 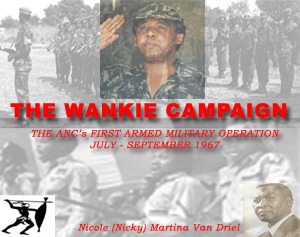 Their mission was twofold: the ANC's military wing, Umkhonto we Sizwe (MK) would embark on a long march home to South Africa, whilst some MK members would assist ZAPU's military wing, ZPRA to establish a guerrilla base at Lupane in north-east Rhodesia. The planners of the march intended to avoid contact with the Rhodesian security forces. This was not to be. A number of skirmishes between the two opposing forces lasted from 13 August to 4 September 1967.